I haven't done a weather analysis blog post in nearly 3 years (wow, long break!). 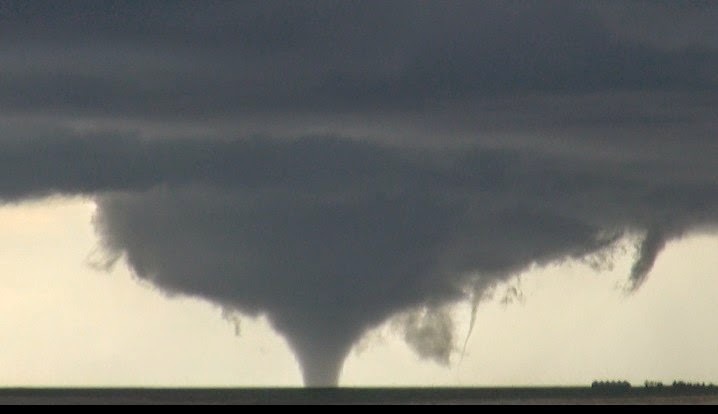 But Saturday's picturesque cold core tornado event (5/9/15) in eastern Colorado prompts me to do a short write up. I've heard from several people who didn't realize this was a cold core setup, so I'll present a few maps to show that it was. Just click on each image below to see it larger. Notice the 500mb cold air aloft (dark blue) coming out over the warm sector in eastern Colorado and western Kansas. The graphic above also shows the enhanced storm-relative helicity (SRH, a source of low-level storm rotation) forecast over eastern Colorado north of the surface warm front (circled). Given the cold air aloft over the relatively warm surface air with dew points in the low 50's F and easterly surface winds, the stage was set for rapid upward stretching and tilting of horizonal vorticity ("spin") associated with the 0-1 km SRH, for possible tornadoes. With subsidence (descending stabilized air) over western Kansas in the wake of the midday storm cluster there, this cell was the easternmost and primary cell to take advantage of the warm frontal zone in a favored location just east of the surface low. The accompanying radar image above is a couple hours later as the supercell produced a large tornado (see photos below), before being undercut by the cold front/occluded front (radar "fine line", see arrows above) around 6 pm CDT as it moved north into the cold air. Another clue that this was a cold core setting is the smallness/compactness of the supercell, allowing for getting the whole storm and tornado into the first photo image above (by my wife, Shawna). Many (if not most) tornadoes associated with cold-core 500 mb lows are small and weak, but this day saw at least one large long-lived tornado due in part to the strong dynamics from the big upper low nearby within a full longwave trough in the jet stream. I should mention that the midday storm cluster and outflow over Kansas on Saturday would have killed most settings regarding tornado potential. But with cold core patterns like this, the atmosphere can recover quickly with the very cold air aloft if there is sun's heating and dew points in the low 50's F, particularly over elevated terrain like eastern Colorado. Cold core settings are also just about the only pattern where you can get tornadoes with a supercell only 60-80 miles from accumulating snow, as was happening near Limon/Denver northwest of the surface low. A truly fascinating day, with the best part being that the tornadoes occurred over wide open country without damage or injury.